The art of decorating fabrics has greatly evolved over time, which has led to the creation of different methods used in fabric decoration. The methods available are endless and will depend on the effect that a person wants to create. Some of the methods used are needlepoint and embroidery. This is a surface embroidery technique that is used in very fine canvas. It is mostly used to create purses, rugs, wall hangings and upholstery. In most instances, the yarn is used. However, strands of embroidery floss may be used so as to achieve a unique look. Since it is worked on very fine canvas, it is done by hand. Canvas types used include Penelope, mono, and interlock. Embroidery is the art of decorating materials by use of a thread and a needle. It can either be done by use of a machine or hand. Because of the need for mass production, embroidery machines have become popular. It basically involves the creation of a design by use of computer software, which is then installed on the machine. It is mostly used by parties that want logos and other details printed on the materials. Embroidery machines are not only available commercially, but are also available for personal embroidery, involving machines which can be used at home. Fabrics commonly used are wool, polyester, and cotton, and is commonly ideal for printing tote bags, t-shirts, jackets and mats, just to mention a few. This is the art of creating designs by use of a thread and a needle. This method is flexible as it allows a person to select multiple fabrics, threads, and stitches. It is unique and reflects the creativeness of the designer, while also allowing mobility. It is commonly used on canvas, cotton and felt, as it can be used on more delicate fabrics. While needlepoint designs are created with tapestry wool which is stitched on a mesh canvas, embroidery uses floss to create a picture or a design. While the canvas used in needlepoint may either be pre-printed or pained with the preferred design or remain blank, embroidery involves pre-printed the desired design and stitching over the lines, hence filling the spaces. The most commonly used fabric in needlepoint is open weave canvas while embroidery uses fabrics such as satin, silk, cotton, Aida, and velvet. 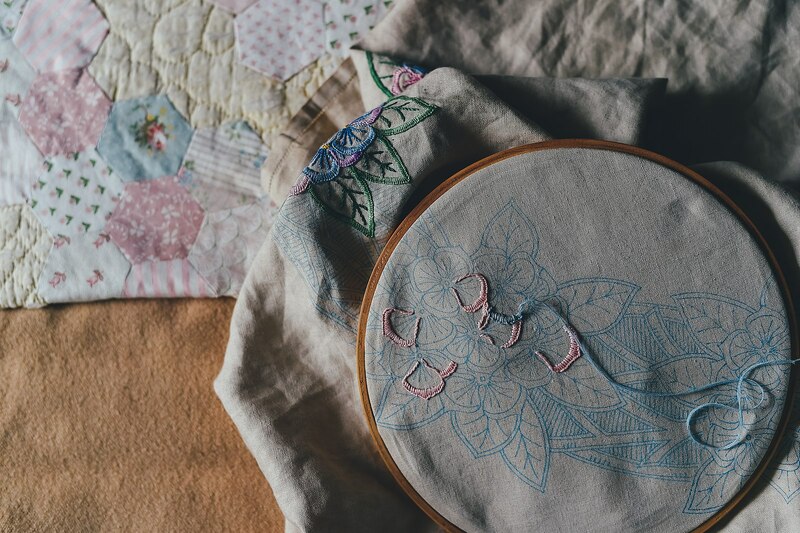 While the concept used in needlepoint is stitching over the design area and covering it with yarn or thread, embroidery involves stitching over the lines and filling in the shapes. While needlepoint is stitched by hand, embroidery can either be done by hand or machinery. 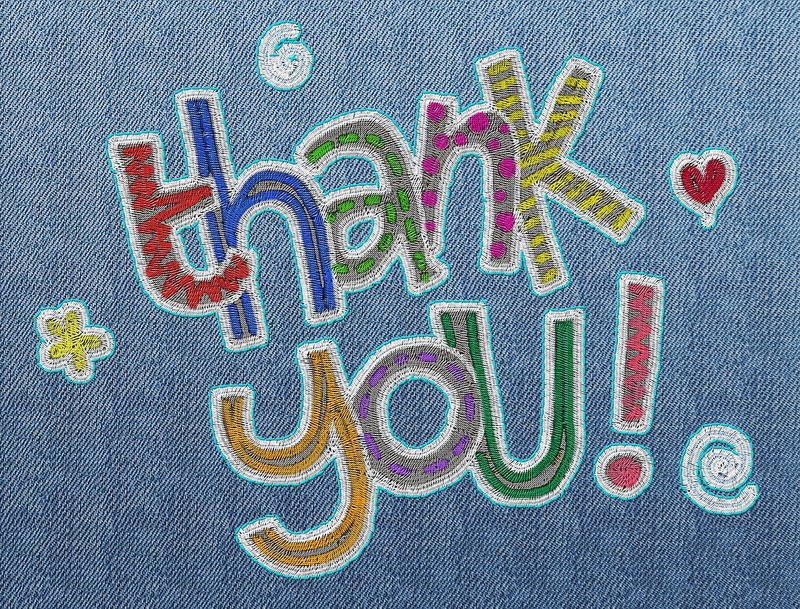 The choice between needlepoint and embroidery depends on a person’s expertise, preference, and the preferred results. Both these methods are effective in fabric decoration and provide an avenue to creatively create different designs. Tabitha Njogu. 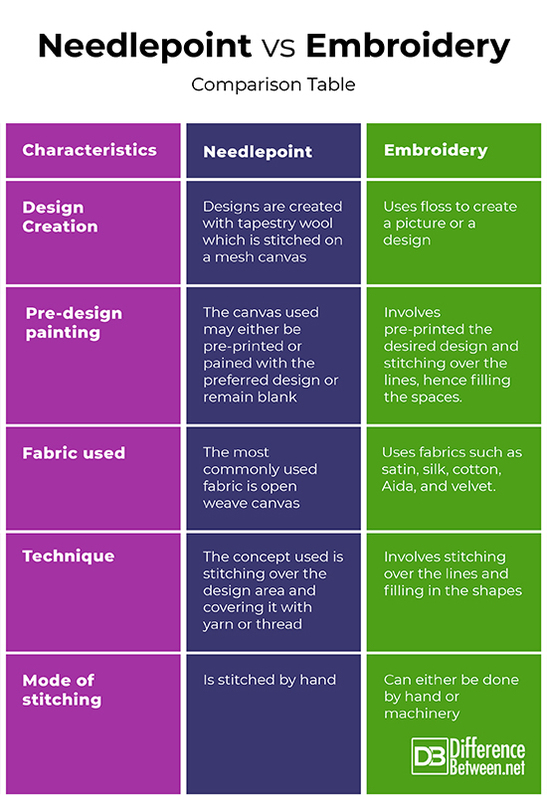 "Difference Between Needlepoint and Embroidery." DifferenceBetween.net. January 17, 2019 < http://www.differencebetween.net/miscellaneous/culture-miscellaneous/difference-between-needlepoint-and-embroidery/ >.